That’s right. NTLD. 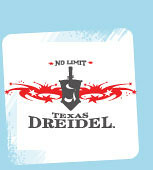 Stands for No Limit Texas Dreidle. Truly a great way to combine old school with a refreshing twist. We played it last night at our shul’s annual “Latkes and Vodkas” party for our 20/30’s group [The Genesis Project] and we had such a great time.